I have mentioned once or twice that I know quite a few people who are expecting. I am always looking for unique shower gifts that are also very useful. So when I was contacted to check out Incredibundles, I was very excited. I have heard of them for a while now, but haven't had the chance to try them. They have so many awesome bundles to choose from; Book Bundle, Year of Toys, Year of Diapers, Sleep Bundles, and more. They also have an option for you to create your own bundle, which is what I decided to do. - Sleep Sheep on the Go from Cloud b: Soothe your child into a restful, relaxing nap or night of sleep with the Sleep Sheep on the Go from Cloud b. This soft, adorable and compact sleep time pal plays calming sounds and is great for home or on-the-go use--anywhere baby needs a little extra help drifting into dreams. - Goodnight Moon (Lap-Sized Board Book Edition): Perhaps the perfect children's bedtime book, Goodnight Moon is a short poem of goodnight wishes from a young rabbit preparing for--or attempting to postpone--his own slumber. He says goodnight to every object in sight and within earshot, including the "quiet old lady whispering hush." Clement Hurd's illustrations are simple and effective, alternating between small ink drawings and wide, brightly colored views of the little rabbit's room. -The Very Quiet Cricket: Full of Eric Carle's gorgeous and lush collage art, a gentle rhythmic text for read-alouds, and a wonder-inducing surprise at the end, The Very Quiet Cricket remains an all-time favorite from one of the true masters of picture-book making. - Harold and the Purple Crayon: Crockett Johnson's understated tribute to the imagination was first published in 1955, and has been inspiring readers of all ages ever since. Harold's quiet but magical journey reminds us of the marvels the mind can create, and also gives us the wondrous sense that anything is possible. - Green Sprouts Cooling Teether: Your baby might not be eating fruits and veggies just yet, but they will love the Fruit & Veggie Cool Soothing Teethers! The easy to hold fruit and veggie shapes offer a variety of textures that help soothe and encourage first teeth to break through. The Fruit & Veggie Cool Soothing Teether is filled only with sterilized water, so simply place it in the refrigerator to chill for extra soothing relief! You could also decide to get a reusable storage container as your packaging. I think my favorite gift to give the new parents would be A Year of Diapers bundle. IncrediBundles will send a beautiful announcement package to the new parents that features a cuddly bear and a certificate for a 3, 6, 9, or 12 month Diaper Subscription. Then, each month, mom and dad can select the brand and size of the diapers they would like delivered straight to their door. How awesome of a gift to give? 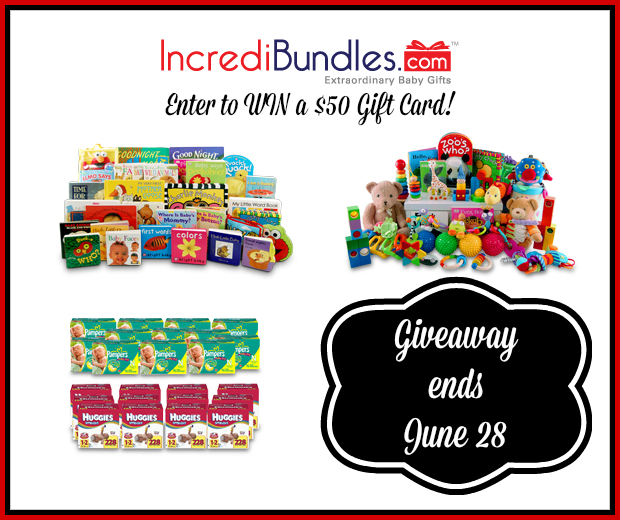 Don't forget that you still have a chance to win $50 to Incredibundles! 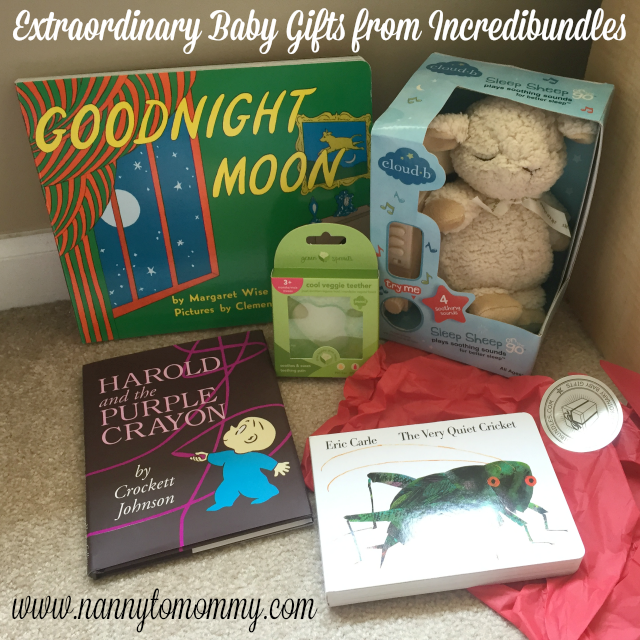 Everything I received can be bought for $50 with the create your own bundle or you could get the Learn & Grow Bundle, Baby's 1st Books Standard Gift Set, Guess How Much I Love You Bundle, or Goodnight Moon Bundle. Or apply it to one of their other awesome bundles. Click on Image below for your chance to win. What do you think of Incredibundles? Let me know below! Although I received complimentary products from Incredibundles to provide this post. All opinions are my own. Oooh I love the Year of Books bundle! What a great library of first books! A year of diapers or a year of toys would be amazing!!!!!! Super cute ideas! I just recently had my baby shower, wish I had received such unique items! Diapers for a year! Definitely. My niece has a cloud b lamb just like that and she absolutely loves it! I like the Baby's 1st Books Deluxe Baby Gift set the most.